Henshaw, Lee W, head-of-household, age 25, born in Kansas; rented home; occupation: grocery, grocery. Hinshaw, Mildred, wife, age 20, born in Kansas; occupation: housewife. Hinshaw, Lee, head-of-household, age 30, born in Kansas; father born in Indiana; mother born in Kentucky; first married at age 25; owned home ($4500 value); radio in home; occupation: retail merchant, grocery store. 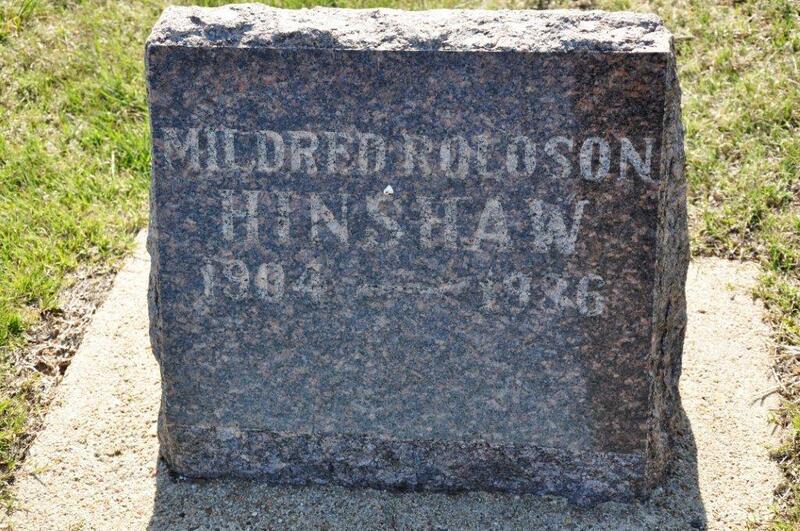 Hinshaw, Mildred, wife, age 25, born in Kansas; father born in Ohio; mother born in Kansas; first married at age 19. Hinshaw, Harold Lee, son, age 4, born in Kansas; parents born in Kansas. 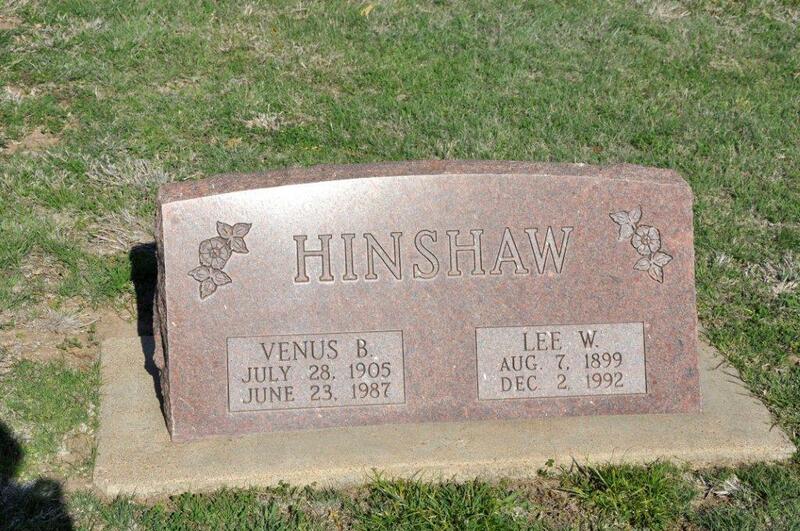 Lee Wayne Hinshaw died Dec 2 19923,9,10,12 [Dec 1 19922]; buried Wakeeny Cemetery, Wakeeney, Trego County, Kansas3,9,10,12. 1930 census, Wakeeney, Trego County, Kansas; roll T626-725, ED 8, page 4A, line #30, dwelling #80, family #80. 1900 census, Wakeeney Township, Trego County, Kansas; roll T623-502, ED 187, page 7B, line #68, dwelling #176, family #176. 1905 Kansas state census, Wakeeney Township, Trego County, Kansas; roll KS1905-165, page 4, line #1, family #34. 1910 census, Wakeeney, Trego County, Kansas; roll T624-458, ED 227, page 197B, line #75, dwelling #160, family #172. 1920 census, Wakeeney, Wakeeney Township, Trego County, Kansas; roll T625-552, ED 240, page 1B, line #67, dwelling #18, family #19. 1925 Kansas state census, Wakeeney, Trego County, Kansas; roll KS1925-160, page 14, line #25, family #119. Contribution from Lawrence Hinshaw, citing: gravestone. Contribution from Larry Hinshaw citing: Wakeeney town records. Contribution from Larry Hinshaw citing: gravestone. 1925 Kansas state census, Wakeeney, Trego County, Kansas; roll KS1925-160, page 14, line #27, family #120.